For the first time in the men’s basketball program at Virginia, the Cavaliers are NCAA champions One year ago, they were the first No. 1 seed to lose to a No. 16 seed in the NCAA tournament. From there, Virginia pulled away. Braxton Key sealed the deal with a breakaway two-handed jam. Hunter led all scorers with 27 points, adding nine rebounds to an excellent all-around effort. 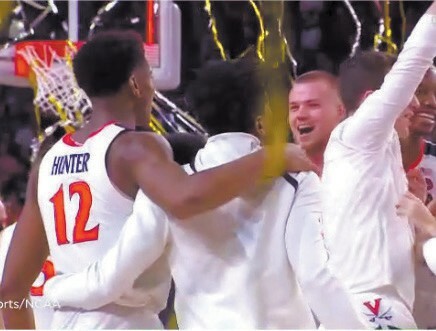 Kyle Guy took home Final Four’s Most Outstanding Player honors. He had 24 points and three rebounds.